Psilothonna schlechteri (Bolus ex Schltr.) E.Phillips, Steirodiscus schlechteri Bolus ex Schltr. 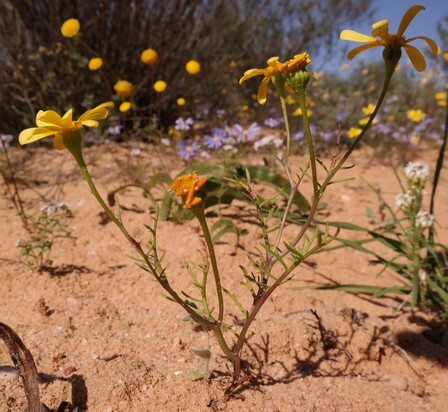 One small, remaining subpopulation of about 200 plants, occupying an area of about one hectare is declining due to ongoing habitat loss and degradation. Lower Olifants River Valley around Klawer and flats below Koebee Mountains east of Vanrhynsdorp. Sandy flats in open shrubland. This species has declined in the past due to habitat loss to agricultural expansion. The only remaining location is threatened by habitat loss to development and overgrazing. A very rare and localized species, known historically from five locations, but remaining at only one due to habitat loss to agricultural expansion. The population consists of less than 200 plants within an area of about one hectare (N.A. Helme pers. obs.). Harvey, W.H. 1894. Compositae. In: W.H. Harvey and O.W. Sonder (eds). Flora Capensis III (Rubiaceae to Campanulaceae):44-530. L. Reeve & Co., Ltd., Ashford. Manning, J.C., Goldblatt, P. and Joubert, L. 2013. A taxonomic revision of the small Cape genus Steirodiscus (Asteraceae: Senecioneae). Bothalia 43(1):109-119.